Combine the eggs, the ricotta cheese, the grated cheese, the sea salt, the black pepper, and the crushed red pepper flakes in a mixing bowl. Whisk the mixture until fairly smooth. Add the basil, the parsley, the garlic, and the tomatoes. Mix well. Add the olive oil to a 12-14 inch non-stick, ovenproof skillet. Put the skillet on medium high heat for three minutes. Pour the egg and tomato mixture into the skillet. Using a spatula, spread the tomatoes out evenly throughout the eggs. When the egg mixture begins to set on the sides, place the skillet in the preheated oven. Bake for 15-20 minutes until the eggs have set and are firm to the touch in the middle. Cut into wedges and serve. Put the shrimp and ¼ cup of the flour into a large zip lock plastic bag. Sprinkle the shrimp with sea salt and black pepper. Close the bag and shake it so that the shrimp get coated with the flour and the seasoning. Add the olive oil and a tablespoon of butter to a 12-14 inch sauté pan. Put the pan on medium high heat. Once the butter has melted, stir the oil and butter mixture well. Shake off any excess flour on the shrimp. Drop the shrimp into the pan and spread them out evenly. Saute for 2 minutes on each side. Remove the shrimp to a cookie sheet lined with parchment paper. 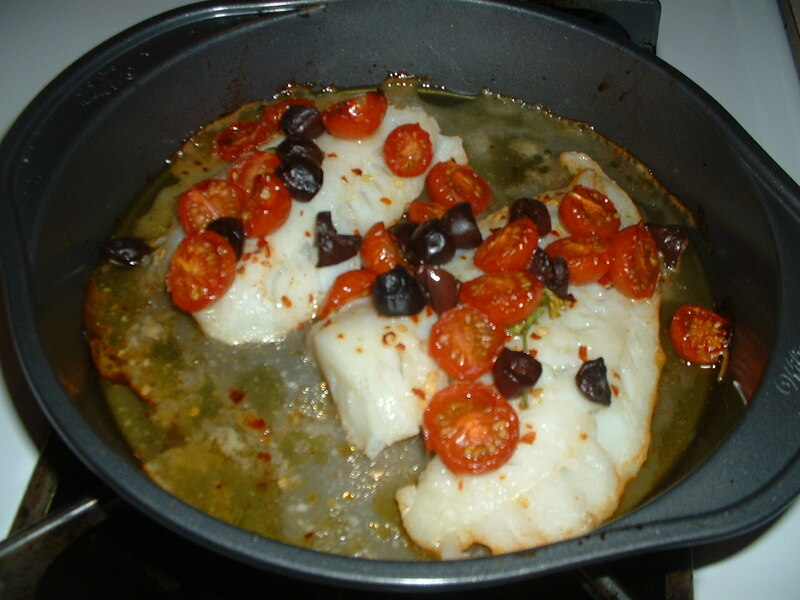 Repeat the same process with the tilapia fillets but cook them a little longer (about 4 minutes on each side). The fish should be golden brown in color. Remove the fish filets and place them on the cookie sheet with the shrimp. Place the cookie sheet into the preheated oven to keep the seafood warm while you make the sauce. Add the garlic and the shallot to the pan that the seafood was cooked in. Season the garlic and shallot with sea salt and black pepper. Cook while stirring on medium high heat for one minute. Add the white wine. Scrape the bottom of the pan to loosen the brown bits that have accumulated. Cook the wine for 4 minutes. Add the lemon juice and the capers. Stir well and cook for an additional 2 minutes. Turn the heat under the pan down to the lowest setting. Divide the remaining tablespoon of butter into four equal pieces. Drop one piece of the butter into the pan. Whisk the mixture until the butter has been dissolved into the sauce. Continue this process until all of the butter has been incorporated. Taste the sauce and add more sea salt and/or black pepper, if needed. 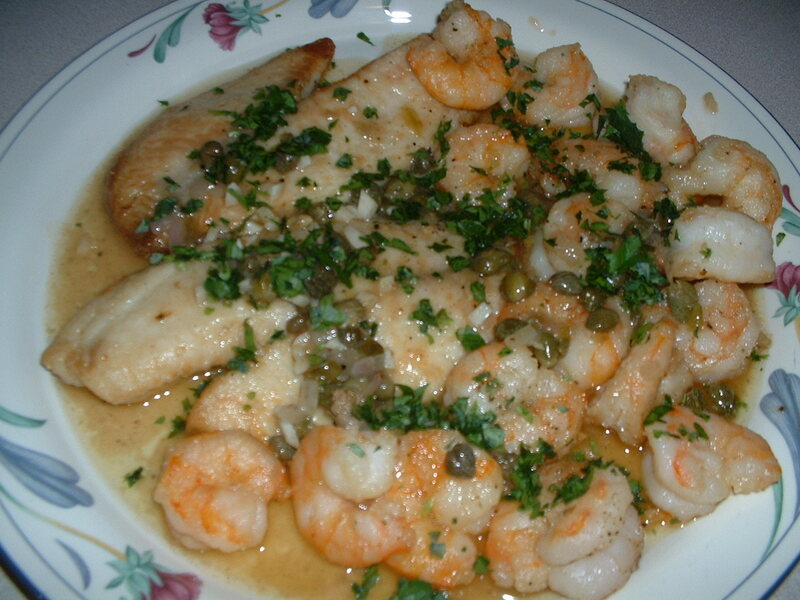 To finish the dish, remove the seafood from the oven and place it on a serving dish. 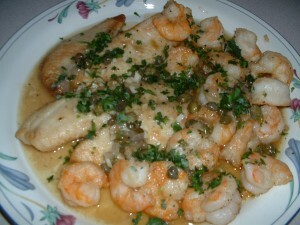 Pour the sauce evenly over the fish and the shrimp. Garnish with the chopped parsley and serve while hot. Preheat the oven to 325 degrees. Brush the red onion and the garlic clove with ½ teaspoon of olive oil and sprinkle them generously with sea salt and black pepper. Wrap the onion and the garlic in aluminum foil. 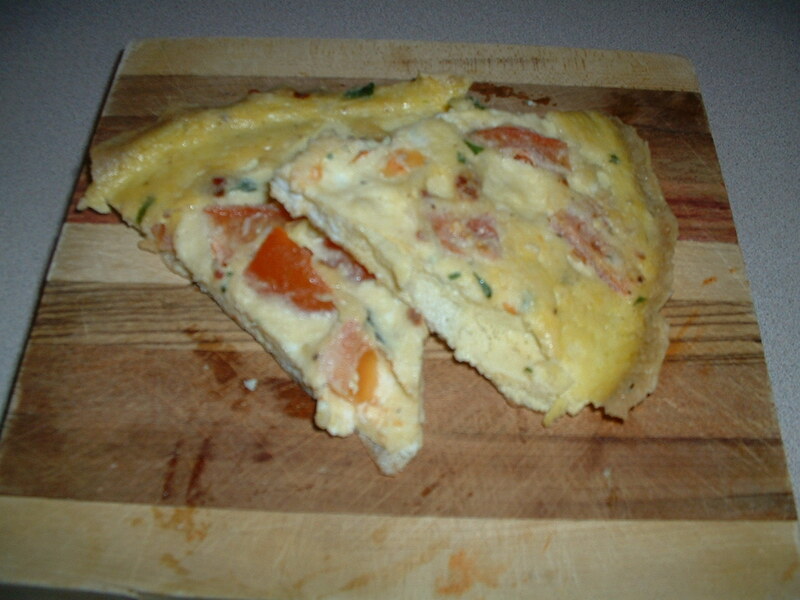 Put the tomato halves (skin side down) in a baking dish. Brush the tomato halves with a teaspoon of balsamic vinegar and two teaspoons of olive oil. Sprinkle sea salt and black pepper on each of the tomato halves. Bake the tomatoes, the red onion, and the garlic in the oven for an hour. After an hour, remove the vegetables and let them cool. Squeeze the flesh out of the roasted garlic skin into a blender. Add the tomato halves, the onion, the Romano cheese, the parsley, the basil, and two teaspoons of balsamic vinegar to the blender. Blend these ingredients until smooth. While blending, slowly add a ½ cup of olive oil. After all of the olive oil has been added, blend the mixture until it is smooth and thickened slightly. Taste and add more sea salt and/or black pepper if desired. Use this dressing on lettuce greens or cooked vegetables. Into a mixing bowl, add the brussels sprouts and the olive oil. Stir so that the vegetables get coated with the olive oil. Note: add more olive oil if needed. Sprinkle the vegetables with the sea salt and the black pepper. Mix well. Spread the brussels sprouts in a single layer on a sheet pan. Place the sheet pan in the preheated oven and bake for 30 minutes until the brussels sprouts are browned slightly. 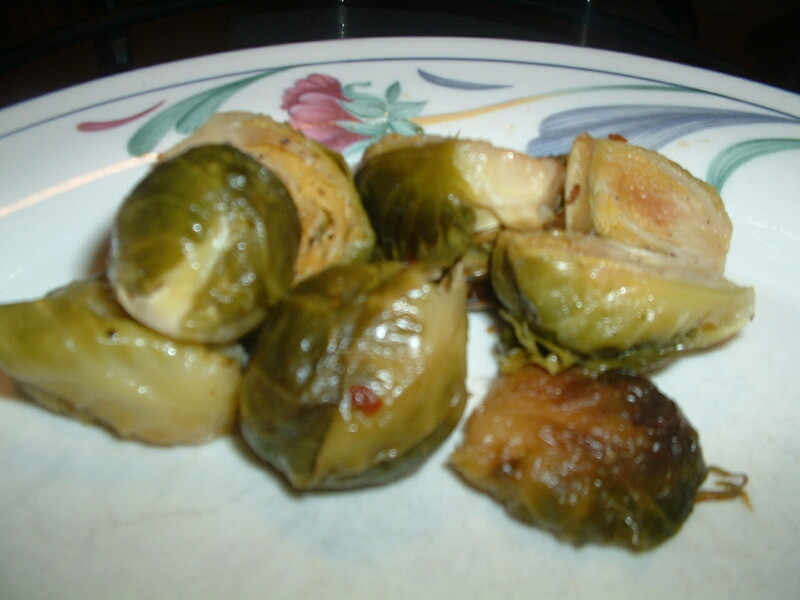 Place the brussels sprouts in a serving bowl. Add the lemon juice. Mix well and serve. Fresh dough is recommended for this flatbread. It can be purchased from your local pizzeria or bake shop. Preheat the oven to 300 degrees. Rub the poblano peppers with olive oil and place them on a baking sheet. Rub the jalapeno peppers, the red onion, and the garlic head with olive oil and sprinkle them with sea salt. Wrap the jalapeno peppers, the red onion, and the garlic head together with aluminum foil. Place all of these vegetables in the oven and roast them for two hours. Allow the vegetables to cool. Remove and discard the stems, the seeds, and as much of the charred skin as possible from the peppers. Roughly chop the peppers and place them in a bowl. Squeeze the roasted garlic flesh into the bowl with the chopped peppers. Remove the outer layers from the red onion and discard them. Roughly chop the onion and put the onion pieces in the bowl with the peppers and the roasted garlic. Add the red wine vinegar and ¼ teaspoon of sea salt. Mix well. Taste and add more sea salt, if needed. Set the salsa aside. Rub the bread dough with olive oil and place it in a large bowl. Cover the bowl with plastic wrap. Let the dough sit out at room temperature for three hours. Preheat the oven to 425 degrees. Brush a large one inch deep rectangular baking pan with olive oil (including the sides of the pan). Place the dough in the pan. Using your hands spread the dough out until it fills the entire pan. Be patient. This process might take awhile. Once the dough has been spread out, bake it in the preheated oven for 10 minutes. Remove the flatbread and let it cool for 10-15 minutes. Brush the top of the flatbread with olive oil. Arrange the tomato slices equally around the top. Sprinkle the tomato slices with sea salt. Next, place the sausage pieces evenly around the flatbread in between the tomato slices. Now uniformly spoon the salsa all over the tomatoes and the sausage. Finally, sprinkle the shredded cheese evenly over the top of the salsa, the tomatoes and the sausage. You can add more cheese than called for in this recipe, if you like. Bake the flatbread in a preheated oven set at 450 degrees for 15 minutes. Let the flatbread cool for 10 minutes. Cut it into squares. This classic combination makes for a great tasting pizza. Into a pot with a lid (large enough to hold the broccoli rabe), add about one inch of cold water and a tablespoon of sea salt. Bring the water to a boil. Drop the broccoli rabe into the boiling water. Cover and cook for three minutes. Cooking the broccoli in salted water will help to get rid of the bitterness inherent in this type of green. Drain the broccoli rabe well squeezing out as much water as possible. Cut the drained broccoli rabe into about one inch pieces. Into a 12-14 inch skillet, add a tablespoon of olive oil. Put the skillet on medium heat. Remove the sausage meat from the casing and drop the meat into the olive oil. Cook while breaking up the sausage meat with a spatula until the sausage is browned. Add the onion, the garlic, the crushed red pepper flakes, and ¼ teaspoon of sea salt. Cook while stirring for two minutes. Add the chopped broccoli rabe to the skillet. Cook while stirring for an additional minute. Turn off the heat and add the lemon juice. Stir the mixture well. Brush the top of the pizza crust uniformly with a ¼ cup of olive oil. 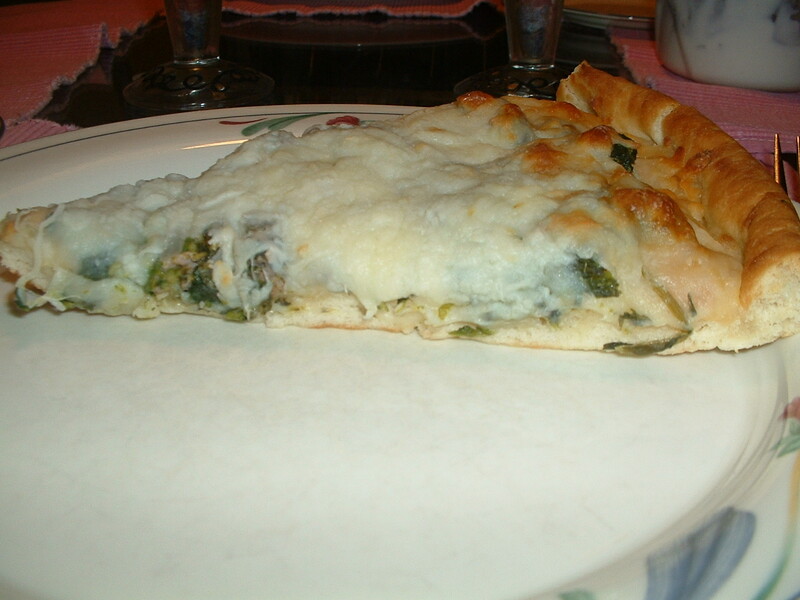 Spread the broccoli rabe and the sausage mixture out evenly over the top of the pizza. Equally top the pizza with the provolone cheese slices. 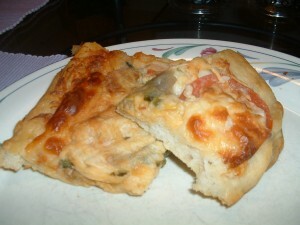 Bake in the preheated oven until the cheese is bubbly and browned slightly. Let the pizza cool for ten minutes before slicing. Into a mixing bowl (large enough to hold the couscous and all of the vegetables), add the minced garlic and two teaspoons of sea salt. Using a fork, mash the garlic into a paste. Add the crushed red pepper flakes and the black pepper. Mash again. Add the anchovy paste and the Sriracha sauce. Mash again. Add the lemon juice and the red wine vinegar. Whisk until smooth. While whisking, slowly drizzle in the olive oil. After all of the olive oil has been added, continue to whisk until the mixture is smooth and thickened slightly. Taste the dressing and add more sea salt, Sriracha sauce, and/or pepper if desired. Preheat the oven to 375 degrees. Place the eggplant slices on a sheet pan. Brush both sides of the eggplant evenly with two tablespoons of olive oil. Sprinkle the eggplant on both sides with ½ teaspoon of sea salt, ½ teaspoon of ground cumin, and 1/2 teaspoon of red cayenne pepper. Place the oregano and parsley stalks on top of the eggplant. Roast the eggplant in the oven for 30 minutes until the eggplant turns golden brown. Cut the eggplant slices into about ¾ inch cubes. 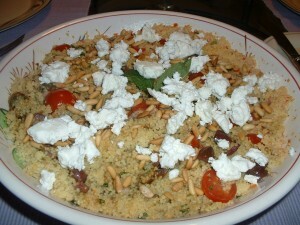 Cook the couscous or bulgar wheat according to the package instructions. While the pasta is hot, add it to the mixing bowl with the dressing. Add the red onion, the eggplant, the kalamata olives, the cherry tomatoes, and the mint. Mix until the dressing coats the pasta and all of the vegetables. Sprinkle the toasted pine nuts and the feta cheese on top. Serve at room temperature. Place the kale in a pot with a lid. Add about one inch of cold water. Cover and put the pot on high heat. Cook the kale for four minutes or until wilted. Drain well in a colander squeezing out as much water as possible. Chop the kale into about one inch pieces and set it aside. Combine the eggs, the half and half, the nutmeg, 1/3 cup of the grated cheese, ½ teaspoon of sea salt, and the black pepper in a mixing bowl. Whisk until well blended. Into a 12-14 inch non-stick skillet, add the pancetta and the olive oil. Cook on low heat until the pancetta is crispy. Add the onion and the garlic. Turn the heat up to medium high. Cook while stirring for three minutes. Add the chopped kale, ½ teaspoon of sea salt, and the crushed red pepper flakes. Cook while stirring for an additional three minutes. Make sure that the kale gets coated well with the pancetta, the onion, and the garlic. Into a greased baking dish, add four cups of the bread cubes evenly on the bottom. Top the bread with half of the kale spreading the kale out uniformly. 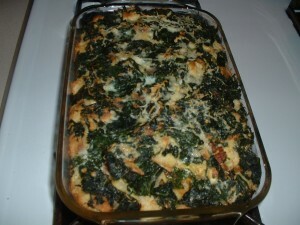 Sprinkle the kale evenly with 1/3 cup of the grated cheese. Add the rest of the bread cubes on top of the kale. Top the bread cubes with the remaining kale. Sprinkle the kale with the remaining grated cheese. 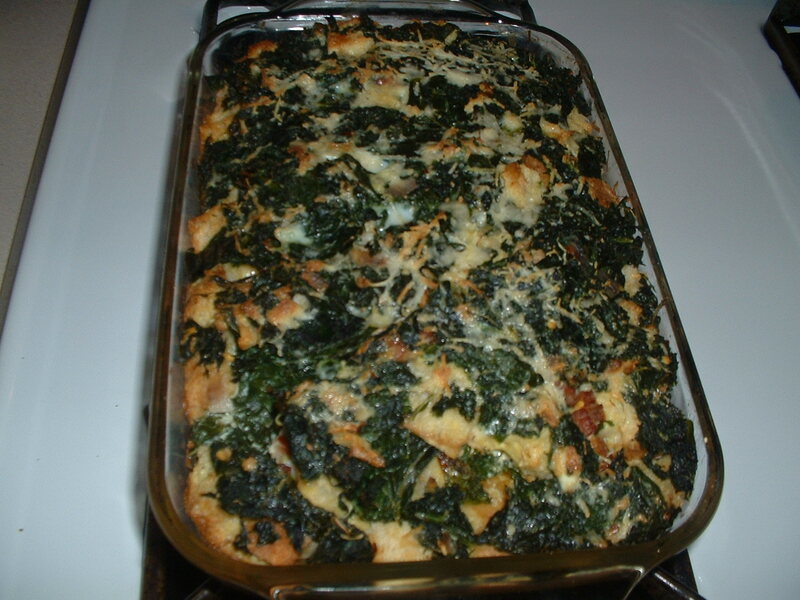 Pour the egg mixture over the kale and the bread cubes. Let the bread pudding sit at room temperature for at least an hour. This will allow the bread to absorb all of the liquid. When you are ready to cook the bread pudding, preheat the oven to 375 degrees. Bake for 45-50 minutes until slightly brown on top. Serve at once. Place the cod fillets on a baking sheet and season both sides with ½ teaspoon of sea salt and ½ teaspoon of black pepper. Place the garlic, the onion, the tomato, the parsley, the olives, the crushed red pepper flakes, 1/4 teaspoon of sea salt, the lemon zest, the lemon juice, and the olive oil in a mixing bowl. Lightly stir the ingredients. Evenly spread the vegetable mixture over the top of the cod fillets. Roast in the preheated oven for 35-40 minutes. Serve while hot. This simple, delicious soup can be made in about 30 minutes. Into a soup pot, add the olive oil and the pancetta. Cook on low heat until the pancetta is crispy. Turn the heat up to medium high. Add the serrano pepper, the garlic, the onion, the carrot, the celery, the sea salt, the crushed red pepper flakes, and the black pepper to the pot. Cook while stirring frequently for three minutes. Add the potatoes, the tomatoes, the water, and the cheese rind. Bring the mixture to a boil and then turn the heat down to low. Cover and simmer for 25 minutes until the vegetables are tender. 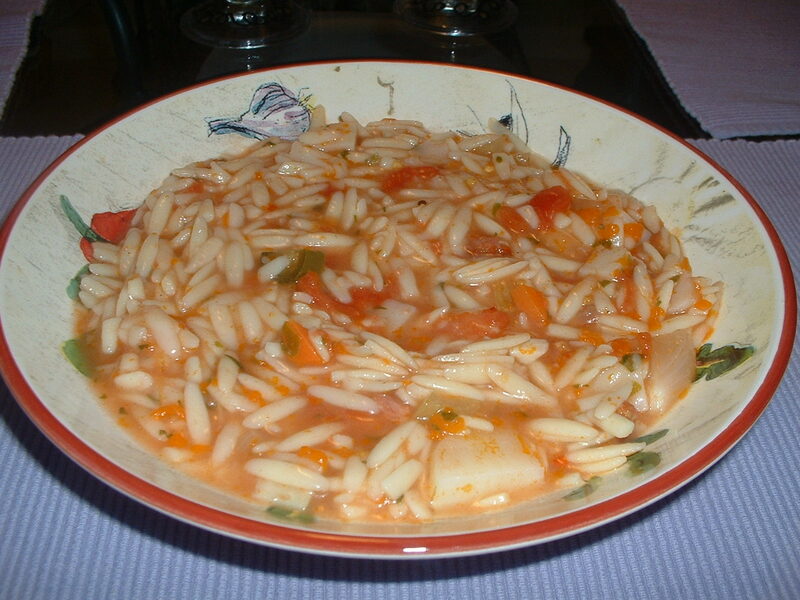 In the meantime, cook the orzo pasta in a pot of salted, boiling water according to the package instructions. 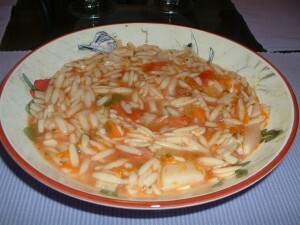 Drain the pasta and add it to the soup. Add the chopped parsley. Taste and add more sea salt and/or pepper, if desired. Serve while hot.